I love Airbnb and I’ve used the service several times. But unfortunately, like with many things today, the scammers have figured out a way to trick you out of your money using the Airbnb service. Here’s how it works and how you can avoid it. I love Airbnb (use this link to get $40 off your first trip if you want to try it out) and have used it several times. If you’re not familiar with it, Airbnb is basically an alternative to staying in a hotel. Anyone that has a home with a spare bedroom, or a condo they’re not using, or even a whole house, can list that space on the Airbnb website and rent it out for whatever price they want to put on it. I tend to be pretty open to trying things like this, and every time I’ve used it has been a positive experience. It saves me money, and I get to meet new people who are sharing part of their home with me. My wife was a little hesitant the first time we used it when traveling together, but she’s a fan of it now too. The main concern for most people who hear about it for the first time is safety. Not just for the guest, but also for the homeowner who is apparently just inviting random strangers to spend the night (or several nights). But there are security measures built in to the process, mainly based on reviews. Both hosts and guests get rated and reviewed (by each other) after a visit, so you can look at that information before you make a reservation. It’s nice to hear what other people have said about a host before you go there. But like almost every other area of our lives, the scammers have figured out a way to manipulate it. The way they do this is actually kind of clever, but you can easily avoid getting caught if you know what to look for. Flexible – this means a guest can cancel a reservation up to 1 day prior to arrival and get a full refund (except for the Airbnb fees, which are minimal). Moderate – this means that to get a full refund (less fees), a guest would need to cancel at least 5 days before arrival. Strict – cancellation by a guest must be at least one week before arrival, and the guest would still only receive a 50% refund. The policies listed above are all in reference to when a guest cancels a reservation. But what if the host cancels the reservation? That means the guest is entitled to a full refund. And that makes sense. If you book and pay for a room, and the host cancels your reservation, of course you should get all your money back. They list their location as available for rent, and they choose the Strict cancellation policy. They take a reservation, and the guest makes the payment. The guest, not paying any attention to what the cancellation policy is (and feeling sorry for the host and their sad story), cancels the reservation. The guest gets a 50% refund, and the host keeps 50% – for never having a guest. So for example if the room was $50 per night, and the guest booked and paid for 3 nights, that’s $150. The scammer “host” makes $75 for doing nothing. And remember, this is just one reservation – the scammer can fill up a calendar with these. And think about this other possible plot twist: since the scammer will never host anyone, he doesn’t even need to list his own house. Anyone can go on Google and get pictures of a really nice house, full interior and exterior shots, and just list it as their own house. And at a discounted price too – they can list a $200 per night property and only ask for $125 per night, just to get more reservations. Now you might be thinking, “Great scam, but how long would it go on? If someone gets scammed, they’re going to leave a bad review, so future guests will read that and not book with this host any more.” Unfortunately, it doesn’t work that way. You can only leave a review for a host if you actually stayed as a guest with that host. Since the visit never took place, you can’t leave a review. 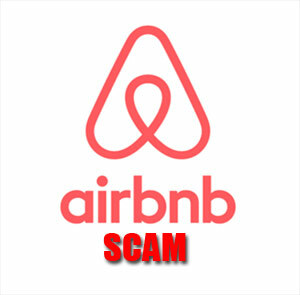 As you might imagine, the most common victims of this scam are people who are new to Airbnb and are not really familiar with the cancellation policies. For a guest that initiates a cancellation of this type, Airbnb does tell them that they will be losing 50% of their payment – but some people just don’t pay attention and don’t think about it. That’s what the scammers are counting on. First, you can just avoid using any hosts that have chosen the “Strict” cancellation policy. Lots of hosts use the “Flexible” option so that’s what I always look for. Second, if a host contacts you and asks you to cancel your reservation, don’t do it. If they are unable to provide accommodations, let them cancel it. Third, and perhaps most important, only book with hosts that have several positive reviews. The vast majority of hosts on Airbnb are good people (in my experience) and their ratings and reviews from previous guests will usually reflect that. In some cases, you might find it necessary to book a reservation with a host using the “Strict” cancellation policy. What if they ask you to cancel after you’ve paid? You don’t have the option of leaving a negative review, but you can definitely report them to the service. Airbnb is aware of this scam, and if they see a trend of this type of complaint against a host they will cancel that account. Of course, the same scammer can just create a new account under a different name, but at least you did your part to help future guests to avoid being a victim.